Adam is doing well. 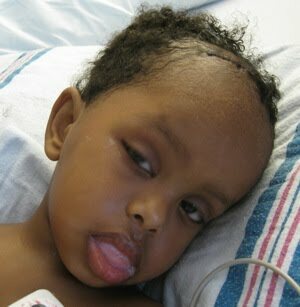 Of course, brain surgery is a Big Deal, and one doesn’t bounce out of bed the next morning. He’s feeling pretty crummy, but he’s recovering. The surgery involved cutting a hole in the top-right of his skull, and they had to go past the right side of his brain, so his left side has been worse than his right, but it’s improving: on Tuesday, he couldn’t look left at all and his left hand was limp: now, he can look all over and he has some grip in his right hand. Thursday was actually a little worse than Wednesday: Adam wasn’t communicating as well, just seemed a little less active, and had a couple incidents where his eyes rolled all the way back and to the right. The doctors here don’t think these were seizures, but we’re keeping a close watch on it. 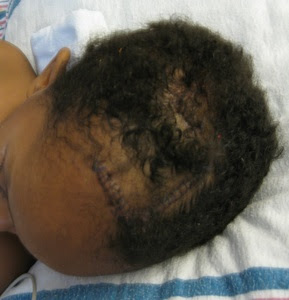 He had his compression dressing taken off yesterday, and the drain in his skull removed. I think this will be a big help: the giant turban of a bandage was not only bulky and making it hard for him to lie comfortably, it was also squeezing his head, which couldn’t have been any fun. Plus, it means we now get to see his stitches. He seems a little more aware this morning (asking for his stuffed doggy), but he slept turned to his right last night (I was sleeping next to him) and fluid puffed up the right side of his face. Again, looks ugly but apparently not very concerning to the staff here. I don’t have a good idea of how much longer we’ll be in the ICU, or thereafter in the general pediatric ward. Here’s hoping we’ll be home by Thanksgiving.